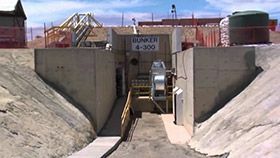 The NNSS safely conducts high-hazard operations, testing, and training in support of the NNSA, the U.S. Department of Defense, and other federal agencies. The NNSS is a unique national resource, dedicated to the safe performance of high-hazard experiments for a diverse range of users. Our scientists and engineers work in collaboration with the national laboratories to conduct subcritical experiments and manage nuclear material operations. High-hazard experiments are conducted at a number of facilities at the NNSS, among them the Big Explosives Experimental Facility (BEEF). This facility plays a significant role in accumulating data to support the Stockpile Stewardship Program. Scientists conduct weapons physics experiments, using high explosives and pulsed laser power to study and investigate impacted materials as they are merged together by the detonations. These experiments aid the national laboratories in maintaining the Nation’s nuclear weapons stockpile.